Brasil’s Bolsa Família programme has been credited with helping to significantly reduce levels of absolute poverty and inequality in Brasil. Started in 2003, and funded by less than 0.5% of the country’s GDP, it now facilitates small cash transfers to more than 50 million Brasilians whose current income places them below the poverty line. By providing the transfers, which require school attendance and health checks for children, Bolsa Família helps to support families in times of hardship, including against unexpected economic shocks and fickle labour markets. As a number of high-income countries seek to reduce social welfare budgets, many low-income countries are doing the opposite. Programmes like Bolsa Família have been found to both raise income levels amongst the world’s poorest, and to improve their overall wellbeing, presenting a potentially powerful tool to support poverty reduction. An influential 2014 report from the International Labour Organization stresses the significant role well-designed social protection programmes can play in reducing poverty, and protecting those vulnerable to it. The positive impact of programmes similar to Bolsa Família in countries from South Africa to Indonesia to Bangladesh, along with many other Latin American countries, supports the ILO’s claim. Luis Henrique Paiva worked on Bolsa Família for five years, running it for the last three. He is currently based at the Brooks World Poverty Institute in Manchester (UK), where he’s been reflecting on his time with the programme, and Brasil’s economic trajectory more generally. A permanent civil servant, Luis returns to the country’s capital, Brasilia in July to continue what currently counts at 16 years of service. Sarah finds out more. What have you been doing in Manchester? I worked with Bolsa Família for five years; as Advisor one year, Deputy National Secretary one year and National Secretary for the last three years. I decided that I should leave the programme – I think it’s good to have a new person in there, with new ideas, with new energy – and I took advantage of having access to the opportunity to be in Manchester, to study basically. Quite a bit of stuff about the independent effect of conditionalities, but quite a few papers about what happened to the country in the last two decades as well. Quite a few comparative studies, especially regarding Latin America. But for me it’s been a time to reflect on what I’ve been doing, in practical terms in the last five years. To be back in Brasil in July a little bit more experienced and prepared for another, different job in the government. What were you doing before working for Bolsa Família? I joined the Brasilian public administration 16 years ago, in 1998. Basically, I’ve worked in the social area of the government. Employment, Social Security, and the Ministry of Social Development for the last five years. I worked for the Chief of Staff in the Brasilian presidency for two-and-a-half years as well, between 2005 and 2007. But even when I was working at the presidency I was covering ministries in the social area. You’ve worked through three presidencies, what are your reflections on their differences? It’s difficult to make comparisons. Both leading parties consider themselves centre-left. During the eight years of Fernando Cardoso’s administration a lot of effort was put into stabilising the economy. Brasil had hyperinflation till 1994. During the period 1995-1998 it was quite difficult to find a good, solid ground for fiscal policies. The country took quite a long time to reach this more stable monetary and fiscal situation. A lot of reforms in social security, the labour market and in the public sector were conducted during this period. Lula and the Labour administration, starting in 2003 put a lot more emphasis on social policies. Keeping the country in a solid fiscal and monetary situation but also addressing the social questions, with social programs etcetera. My impression was that Lula was able to put all this emphasis on social policy while at the same time keeping a solid economic foundation for the economy. It was out of that background that Bolsa Família was started? The very idea of conditional cash transfers emerged in Brasil and Mexico in the second half of the 1990s. Latin America is probably the most unequal region in the world, in economic terms, and so in Mexico and in Brasil, in the second half of the 90s, this idea of cash transfers with a component addressed to improve the human capital of children emerged. Firstly in local administrations in Brasil, and in 1997 as a national rural programme in Mexico. In the beginning of the 2000s Brasil had three different conditional cash transfer programmes, and Bolsa Família unified them as a more coherent, strong programme. With higher coverage, and eliminating all the overlaps that we had. So it replaced those programmes? Yes, that’s it. Basically it unified all the members that still complied with the eligibility criteria. Those who were members of other programmes continued to be members of the Bolsa Família programme. The programme reached 11 million families by 2006, and around 14 million families more recently. Which means basically 1/4 of the Brasilian population. 50 million people. This kind of programme, like Bolsa Família, or Mexico’s Prospera, and other programmes like these were addressed to part of the population that was not covered by traditional social insurance and social assistance. Can you explain the difference between social insurance and social assistance? Social insurance is basically a kind of social protection for those that can pay for it. It’s traditionally related to the formal labour market, where people contribute to social security on a monetary basis. They are covered against a lot of social risks, like unemployment, sickness and old age. Obviously, as it is related mainly to formal jobs – and in developing countries a relatively small number of jobs are formal – a large part of the population remain uncovered by these schemes. I think it is the first time that this region had a programme addressed to people that are in their working age, and their families, and children especially. Who are able to work, are frequently working, but continue to be poor and with no way to contribute to social insurance. It’s the first time that social protection reached this quite large group of the population. Was it quite a battle to convince the non-poor population that this was a valid, important thing? This whole story about how these programs are assessed by the non-beneficiaries is quite complicated. In the very beginning I think that there was resistance to the program, the program suffered a bit. But after a while, I think that we can tell this story as the story of turning good policy into good politics. These programs in general, in several different countries, were evaluated a lot and they frequently present excellent results in terms of impacts on reducing poverty, poverty reduction, school attendance. My impression is that the resistance decreased a lot. As the results started to show? Yes, I think so. First, there are lots of good results to show – these programs work. Secondly, they are becoming part of the landscape. They are there. As time goes people tend to accept the idea of protecting the poor population, and having some sort of safety net for that. The last figure I heard was during the 2014 election – that three out of each four Brasilian voters support the program. Which is one of the highest rates of approval among the government programs. In spite of the resistance that we could find at the very beginning, and still today in certain groups of the population, I think that the vast majority of the Brasilian population now supports the program. Why are children considered an important group to target? Brasil built, during 70 years, a relatively strong set of social security programmes addressed to the older population. Older people are in general very well-protected against poverty. Poverty is concentrated on children; they were unprotected. As I said, this is the first time that a programme addressed families that are struggling – they are working, they are able to work, but even so they are not able to make enough money to avoid poverty. When you address this public you reach the children. That’s the first part. The second part is another aspect, that we should do something for these children in the long term. If they have better access to education and healthcare they will probably have a better prospect. Both in the short and the long term we could do something for these children, using cash transfers. On the other hand is the idea of conditionality, to reinforce the right to have access to education and healthcare. How much does each family actually get? It goes to the household, right? Whenever it’s possible it goes to the mother. The average benefit now is 170 reais [approx US $54]. Which is a very modest benefit, per family, per month. Actually we now have four different kinds of benefits. If the family is extremely poor, independent of its composition they will receive a benefit at the level of 77 reais. For every child aged between 0 and 15 a benefit of 35 reais. Adolescents aged 16 and 17 will receive a benefit at the level of 42 reais. Overall, taking into account their declared income plus all these benefits, if they remain under the poverty line they will receive a fourth benefit. A top-up benefit, basically. To bring them over the poverty line? Is there a limit to how long the family can receive it for? No. We work with a minimum period. If, after their first year the family find a job and their income increases above the eligibility criteria they will continue to receive the benefit for an extra two years. Just after that, if their income is still above the eligibility criteria the benefit is cancelled. The idea is to protect them while we imagine that income is not secure, not stable. To have a minimum time but not a maximum time. Poverty and extreme poverty are very dynamic. People that are chronically poor are a very small group of the poor population. Most of the families are in and out of poverty because they are in a very unstable situation in the labour market. The idea is that, if you cancel the benefit in the first moment a family is out of poverty – the family may need the benefit again in the near future. The idea is to give a minimum length of time to be sure that that situation is more stable, so they can live without the benefit. How do you define chronic poverty? Over the course of their lifetime? Yes. That’s why, to define a maximum period for families to be receiving a benefit doesn’t work. For quite a few of these families, probably there is just a solution in the long term, with better education for their children, better healthcare. Hopefully in the long term it will work. These children will be better prepared to face the labour market and take advantage of it. Are the jobs there, within the formal labour market? That’s another important part of what happened in the last, especially the last 12 years. Almost 20 million formal jobs were created in Brasil. That’s quite a lot. Basically it’s related to economic growth, and the process of formalisation. They are not necessarily new jobs, but jobs that were migrated from this grey economy to the core of the economy, that started to be protected by social insurance. Obviously part of these jobs are entirely new, they were nowhere before. They are pretty much connected to economic growth. What’s interesting about that is that a much larger part of the Brasilian population is now protected by social insurance, due to the fact that they are in the formal labour market. A larger share of the working population are protected by these more comprehensive and strong schemes of social protection. Even so, I think there’s a consistent part of the population that still need social assistance, and Bolsa Família’s part of it. Is there pushback from the government to the informal market? It seems to be that it’s quite accepted. Even developed countries have a small share of their labour market that is this grey economy in which no one knows exactly what is happening. They don’t pay taxes, but they have no social security either. But in general richer countries have a much smaller informal economy than poor countries. There is just one way to consistently reduce informality in the labour market. Which is growing, through economic growth. You can do lots of other things to improve formality in the economy, but even so, until the country’s fully developed, I truly believe that a considerable share of the jobs will be there, simply because it’s impossible to be the other way. So for you, economic growth is definitely the path to poverty reduction? Yes. Economic growth is probably the most important part of poverty reduction. First, because it generates new jobs that can generate a secure source of income, and second growth generates revenues for the government to address poverty through using transfers. Economic growth cannot be considered the only solution, the thing that will solve everything, but it’s an important part of it, no doubt about it. Can economic growth create poverty and inequality? Even if it reduces it in some ways? Find a very, very poor country – economic inequality is probably very, very low. Bangladesh has a lower Gini coefficient than the UK. But the fact is, the vast majority of people in Bangladesh are poor. When you start growing from this level, because only part of the population take advantage of the economic growth, inequality is going to increase. Eventually, if you have proper fiscal policies and transfers policies in place, economic growth will bring the poor population to an acceptable standard of living, and the country will start to be fairer again, or start to have lower inequality again. That’s the whole expectation – it does not mean that all the countries fit in this scheme. It depends a lot on what country you are looking at. I agree with you, economic growth can result in increased inequality, but I think that in general it’s better for the country to have economic growth than not, because you’ll have a lot of different possibilities. It does not mean that economic growth will be pro-poor in all different situations. Even so, it’s better to have economic growth than not to have. There is criticism of modernisation processes leading to mass rural-urban migration, and a rise in urban poverty. What are your thoughts on that? Brasil now has a small share of its population live in rural areas. It’s less than 15%. It’s not a rural country anymore, it’s basically an urban country. Obviously the mass migration from rural to urban areas tends to increase urban poverty. But you can’t say that the urban poor are in a worse situation than the rural poor. People tend to be very smart. They know what their conditions were in the rural areas and what their conditions are in urban areas. If they insist on being in urban areas, they are basically saying to you that, despite their situation being very bad, it’s better than it was in rural areas. There is this romanticised view of the rural life. Once the government tried to take urban poor people from Brasilia, the capital, to their home city, in the countryside – they gave them some support to stay there, and to recover their former life. After a few years they were back in Brasilia. They can’t disagree that their life is bad in Brasilia, but it can be even worse in rural areas. If people in general migrate to urban areas and stay there, I respect their view. I would do the same thing if I were them. I don’t believe that we are generating poverty, developing rural areas. Probably we are revealing some sort of poverty that we people who live in urban areas didn’t know existed. 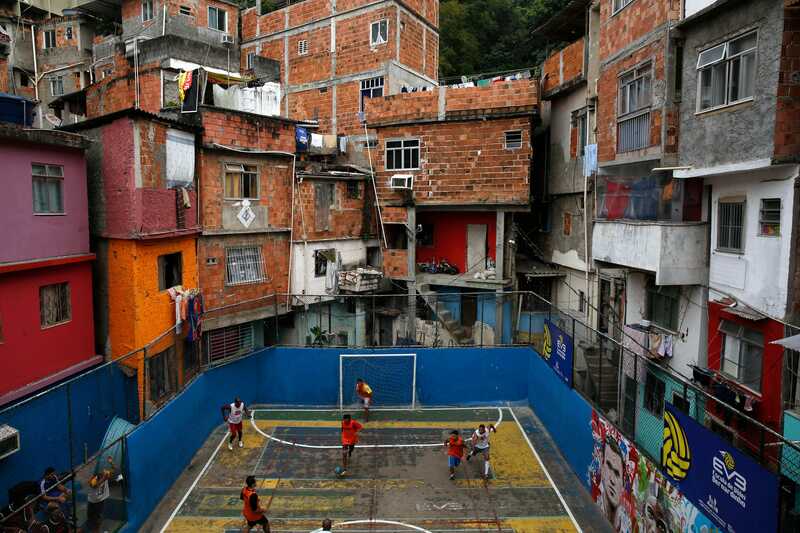 Brasil’s massive, and I imagine that what poverty looks like in one part of the country is quite different to how it presents in another, and how people deal with it. Which must be difficult when you’re running a programme like Bolsa Família – you can’t have one strategy to reach everyone. Yes, poverty is unequally geographically distributed in the country. Poverty is massively concentrated in the Northeast and Northern regions, in relative terms, and in absolute terms in the Northeast region. Naturally the programme tends to be concentrated in the Northeast and North as well. It’s mainly addressed to poor people where poor people are. Based on data from the census, we have an idea of how many poor families live in each municipality. We try to reach these families. The design is the same, but it works very well in poor regions. Actually, indicators demonstrate that the programme works a little bit better in poor regions than it works in more affluent municipalities. What’s interesting about that is Bolsa Família is managed in a decentralised context. In other words, it’s a federal programme, but it relies a lot on the work of local governments. A lot. One could be concerned about how poor municipalities in poor states, in poor regions of Brasil can handle a programme like it. One could be concerned that these municipalities would not be able to run the programme locally, and so the poor people in these regions would continue to suffer just because of a lack of local capacity. But when you look at quite a few indicators of how well the programme is doing in every Brasilian municipality we perceive that – for instance let’s consider that those normal errors that you have in targetted programmes are basically the error of paying benefits for those that are not entitled and not paying benefits to those that are entitled. Inclusion and exclusion errors. All these indicators are the best possible in the Northeast region. They know better who the poor population are, they are able to find them, they are able to reach them, they are able to collect their data, and you are able to pay the benefits. These indicators are systematically better for the Northeast region than in the South. We can’t see any effect of what could be defined as a lack of administrative capacity of these governments. Maybe because, for these local governments, poverty is a much more important question. It’s a much more important political issue than it is in Santa Catarina, for instance. In Santa Catarina extreme poverty is almost zero. For many local mayors, it’s pretty much irrelevant to deal with this question. But for a mayor in the Northeast it’s fundamental. So yes, they do address a lot of energy to deal with it. You referred to pro-poor growth earlier. Can you explain what that is? I’m not an economist, so it’s quite difficult for me to try to understand what economic growth that promotes inclusion is, and what the drivers are behind this. I think that we’ve got quite a few drivers. The first one’s demographic. Poor families are having fewer kids in Brasil, it’s systematic. And these kids are receiving a much better education than kids used to receive 20, 25, 30, 40 years ago. Is there something that’s been identified as a catalyst for that? People having fewer children? I think it’s just a general movement that you can observe in all developing countries. It basically follows the same pattern that you can observe in the history of developed countries, but it’s happening very fast. Much faster than it occurred in developed countries. Demographic changes that took a whole century, or 70 years to happen in the history of developed countries are happening in 20, 25 years in developing countries right now. Which obviously creates a lot of problems as well, especially for the long term prospects of social security. With an ageing population, and not being able to support them? That’s it, an ageing population, reduction in the working population, benefits being paid to older people – this whole arrangement is quite complicated. It’s now quite complicated in several developed countries, and it will probably become more so, just because this demographic transition is occurring at an accelerated velocity. But, the fact is that in the short term a reduction of the number of children in poor families is something that improves their per capita income, obviously. Proportionally there are more adults working in the family. Second, it improves the prospect for these kids to be better educated, and what we can see in Brasil is a much more equal distribution of schooling. When you look at the Gini coefficient of years of schooling, it’s been falling the last 20-something years. It’s made a monotonic, steady decrease of the concentration of years of schooling. So, schooling has been much better distributed. As a result of this, inequality in the labour market has been falling since the mid-90s. Pretty much everybody has better access to education, which means that that situation where a few people will find extremely well-paid jobs just because they are few people is not going to be in place anymore. Lots of people are able to dispute those jobs, and so the premium of these jobs will decrease and the labour market will tend to be less unequal. If you consider the role of government transfers on top of it, you can understand the situation where the per capita income is much better distributed than it used to be. Obviously we are talking about the Brasilian context, or Latin American context, if you will. Income inequality continues to be extremely high in Brasil. The Gini coefficient in Brasil is one of the highest in the world. It’s much lower than it used to be, but even so, much higher than it is, for instance in the United States. Which is one of the most unequal countries among the OECD countries. We, in Brasil and in Latin America in general have a long way ahead to have a fairer society. Is there much knowledge-sharing between countries within Latin America, about social protection programs? We have been talking a lot with other countries that run the same kind of programmes. Countries like Mexico – or Argentina, or Uruguay or Chile. There is a general tendency to share experience, with Mexico especially, because they have a large conditional cash transfer programme as well. Progresa, that later on became Oportunidades and now is called Prospera. They changed the emphasis here and there, but it’s basically the same programme. We share experience with them for sure. What do you think the implications of the recent slowdown in growth in Brasil are for Bolsa Família, being a tax-funded programme? In the short term I think that nothing’s going to happen with the Bolsa Família programme, no cut in the budget. The government is really protective of the budget for the programme. I’m pretty sure that nothing’s going to happen. Obviously, in the mid-term at least, prospects of continuing to improve the programme depend on economic growth. Not saying that without economic growth the budget is going to be cut, but if you want to continue to improve the programme, and to increase the transfers to poor families, we have to have the proper revenue to do that. It depends on the real economy. I think that in the short term the most important challenge is to find a way to recover the economy and have good rates of economic growth again. Do you think it’s just a dip? As I said, I’m not an economist, but I think that what was in place during the period Lula was president was a commitment to deliver a stable economic environment appropriate for investors to invest – in other words, a proper economic context where investment and growth can take place on the one hand, and on the other hand commitment to deliver well-designed social transfers. I think that right now we are in the first leg of trying to recover a sound economic environment, where we can have economic growth and investment, in a very secure environment. Confidence among the economic actors etcetera. In the short term commitment to Bolsa Família will remain, but if you want it to be improved – not only to be maintained, but to be improved, I think that will depend on economic growth. Luis Paiva is a permanent civil servant in the Brasil public administration. He headed Bolsa Família for three years.